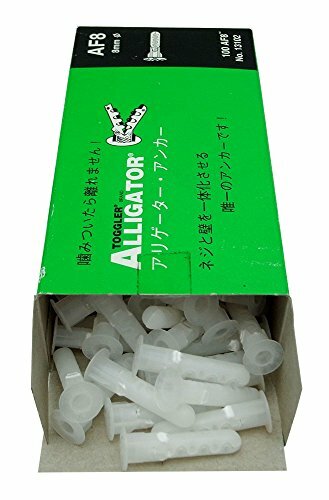 The TOGGLER ALLIGATOR AF8 flanged anchor provides a secure hold in solid and hollow concrete, brick, stone, and drywall, and is made in USA. Once inserted into a 5/16" drilled hole in a wall, ceiling, or floor, the anchor accepts a #8 to #14 size screw with a thread length at least equal to the thickness of the item being fastened plus 1-13/16". The anchor head is flanged for additional stability compared to a flush-mount head when installing into hollow material and has fins that grip the mounting material to prevent spinning when a screw is inserted. When installed within a solid material, the corrosion-resistant polypropylene body expands and elongates to fill and mold to the hole. This helps distribute the force evenly throughout its length to help prevent wall fracture. When installed within a hollow material or a solid material with unexpected cavities, the anchor's jaws open as a screw is inserted, locking the anchor and screw within the material. A5/AF5 3/16" #8 sheet metal screw 57 lb. 544 lb. A6/AF6 1/4" #10 sheet metal screw 69 lb. 675 lb. A8/AF8 5/16" #12 sheet metal screw 85 lb. 1,025 lb. A10 3/8" #14 sheet metal screw N/A 1,168 lb. A5/AF5 3/16" #8 sheet metal screw 125 lb. A6/AF6 1/4" #10 sheet metal screw 153 lb. A8/AF8 5/16" #12 sheet metal screw 171 lb.